Craft in America is pleased to announce that we have two new catalogs to add to our repertoire of publications. 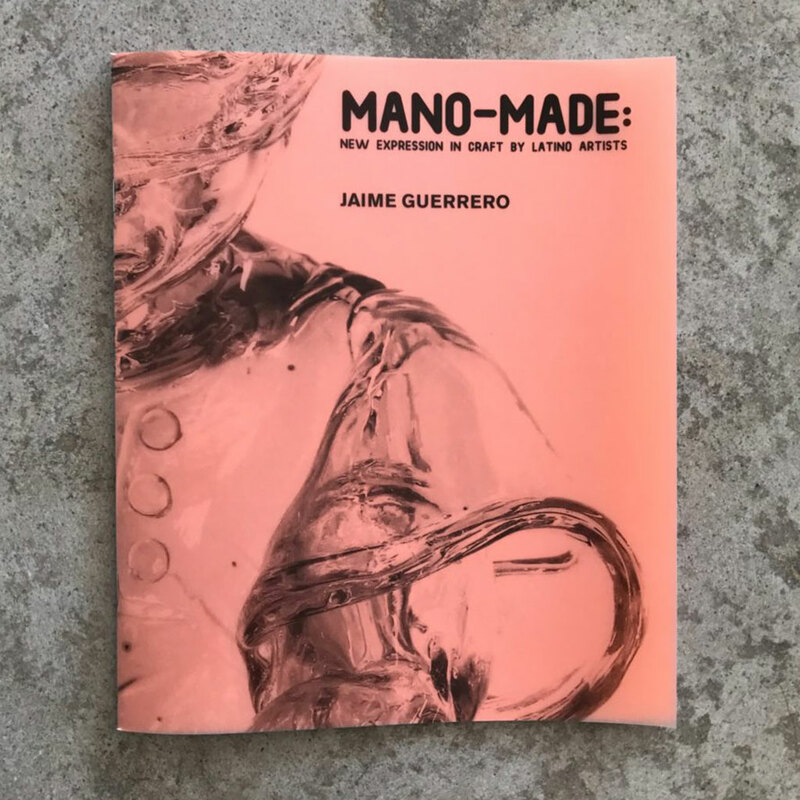 Jaime Guerrero’s catalog is available for a donation of $10 and Gerardo Monterrubio’s catalog is available for a donation of $13. Please email info@ for all inquiries. Mano-Made: New Expression in Craft by Latino Artists is a trio of subsequent solo exhibitions by three preeminent Mexican-Californian artists— Jaime Guerrero, Gerardo Monterrubio and Consuelo Jimenez Underwood. Each artist employs unprecedented formal approaches to material and asserts conceptual perspectives that have otherwise been excluded from the canon of the contemporary art world. With prowess, they all push the potential of their chosen media to new heights of expression. These three individual artists are unified by their desire to communicate ideas and stories through their works. For each artist, personal identity and cultural heritage play a strong part in the narratives that they touch upon in the art. Each uses craft to articulate messages about American and Chicano culture, personal experiences, Latino and bicultural identity, and the ever-mutating socio-political tensions that exist in California and the United States as a whole. The significance of the object as artifact and the role of the artist in sculpting this legacy, is a fundamental pursuit to all three. In planning these three exhibitions, it was evident from the outset that each artist would generate powerful and timely elucidations, but their commentary became even more pertinent over the past year and a half as the global political climate shifted. Each artist tackles the fiber of monumental social struggles through their work, yet they scale their approach to the intimacy of the gallery space. The Craft in America Center, as an alternative art space in the heart of Los Angeles, served as a laboratory for their exploration and expression. For Los Angeles native Guerrero, whose show is the first in the series, reverence for the figurative form, and the spiritual and metaphorical potential of glass to represent a culture at any given time, are pathways for investigation. Jaime is one of the few and first artists in the world to hot sculpt life-size figures in glass. For this installation of his work, he created his most compositionally ambitious group of figures yet. The inherent nature of glass in its duality of strength, yet fragility, mirrors the nature of the human body and gives his work added impact. He takes glass into untapped realms with his remarkable ability to imbue his medium with palpable emotion and spirit. Occasionally, the end result is a lighthearted romp in street culture. However, in recent work, as exemplified by this installation, Guerrero wades deep into the waters of post-colonialism to confront paradigms of bicultural identity. Monterrubio’s intense exploration of the ceramic vessel and its trajectory of serving as a canvas for transporting cultural narrative are driving themes in the work he generated for the second exhibition in the trio. Located between muralism and graffiti, two realms of the art world that have been linked with Chicano art, his approach to imagery on porcelain taps into additional pan-global traditions that span all of cultural history. 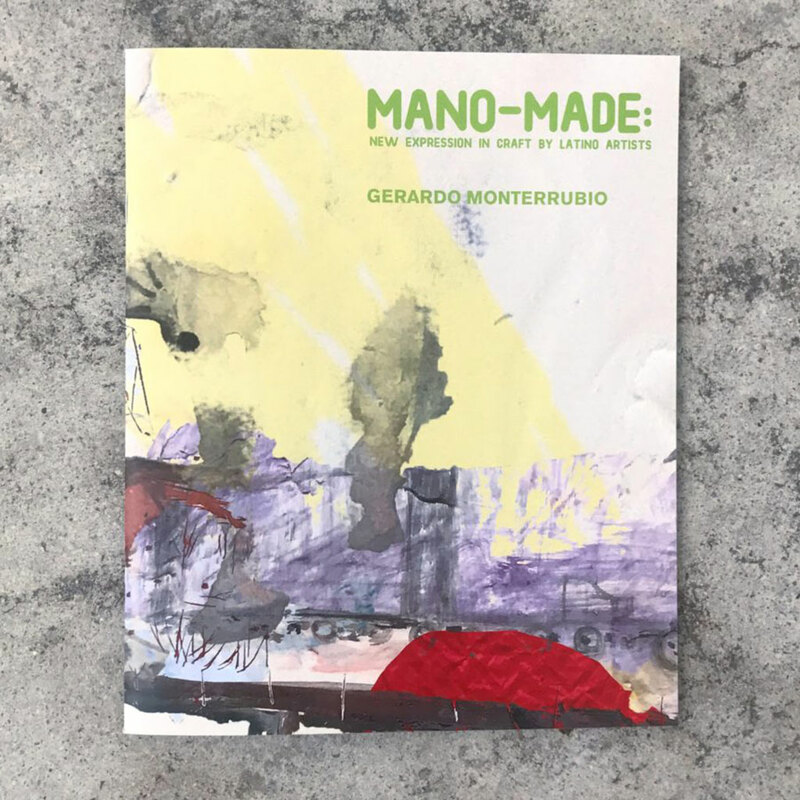 Like Guerrero, who is inventing relics for the contemporary world and bringing to these the voices of those who are normally muted or silenced, Monterrubio’s brush records glimpses of life in urban Latino culture with the same desire to document modern society for the sake of posterity. Recently known for her series of large-scale depictions of geographic borderlines, Underwood instills new meaning into the cartological representation of various border states and American cities in the final exhibition. Incorporating various fiber materials, found objects, wire, and nails, she creates powerful works of dynamic beauty that spark discussion about the boundaries that define place and identity. Consuelo’s art consistently reflects her personal tricultural perspective and fundamental belief in the interconnectedness of societies. Beyond the identifiable cultural implications, she is compelled to shed light on the detrimental impact of the border wall on surrounding animal and plant life. For Consuelo, our imprint on the natural environment is the most significant artifact that modern society will leave behind. Working in glass, clay, and fiber, these three pioneers are using traditional, age-old materials in visionary ways to voice the conflicts and uncertainty that are at the forefront of American culture in this unpredictable time.